Colored her entire body with a blue marker. Colored the cream-colored banquette in our kitchen with a blue marker. Ate dog food. And liked it. Moved a trash can. Used the trash can to climb on the counter. Removed a sippy cup from the cabinet. Filled the sippy cup with dog food. Ate the dog food. Still liked it. Laid face-down in the aisle at church. Which was preceded by her yelling, "Jesus! I don't like him!!!" Shouted, "Oh no! What happened?" As poop-lettes rolled out of her diaper. Tore off a piece of toilet paper, dipped it in the toilet, and proceeded to "clean" her face. Pooped in the potty, then sat there for 45 minutes while flushing the toilet repeatedly and shouting, "Oh no! Where'd my poopy go?" 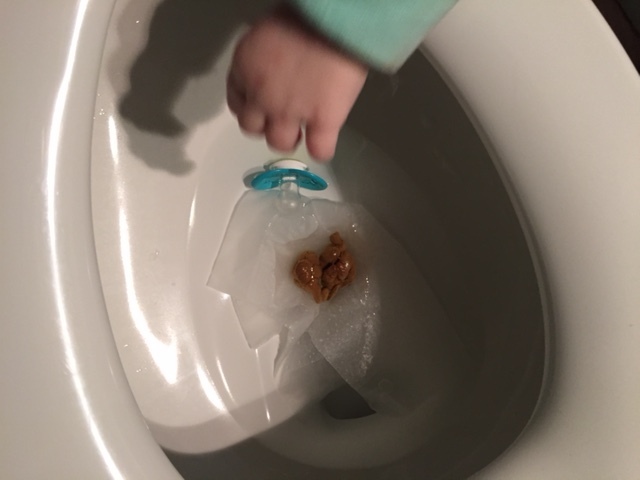 Dipped her pacifier in the toilet while her brother was peeing and then put it in her mouth. Pooped in the potty, dropped her paci on top of her poop, reached in for her paci and put it in her mouth. Because I was too busy taking a picture of this event to stop her. Please be a kind citizen and refrain from any negative feedback or insight on how I should discipline my child, or how my newly-2-year-old should be hand-rolling her own vegan sushi by now . This is the "Not" Awesome list. The Awesome list is extremely long and I've been working on it for hours and hours, and I have come up with 1 or 2 promising "awesome" things that might have happened this week.